Part + Parcel presents work by artists Mark Joshua Epstein and Todd Kelly. Exploring ideas of segmentation, Kelly and Epstein interrogate their surfaces. The artists, situating themselves in a trajectory of abstract painters who explore layering, gesture and geometry, take their work in this show a step further, exploring the notion of the individual object. Whether creating a large work from smaller components, or presenting a new arrangement of existing works, Epstein and Kelly ask questions about what constitutes a singular work of art. Epstein’s work is made up of several smaller panels. Hand built by the artist in his studio, the arrangement of the panels changes continually throughout the making process as components get added, taken away, and turned in different directions. This modularity, born from his desire to ensure a certain amount of improvisation in his studio, is integral to Epstein’s process. The constant rearrangement aligns with Epstein’s interest in exploring his gay identity through abstraction. While he believes that the idea of one correct presentation for a work of art is a heteronormative conceit, allowing for a work to be reconfigured, or for its components to be added to later works, alludes to ideas of shifting identities and queerness. For Part + Parcel Todd Kelly presents a new arrangement of existing works, brought together here for the first time. For Kelly, the grid acts as a scaffold upon which to hang improvised compositional elements. Exploring layering, Kelly’s work embraces play, chance and the tension between casual gestures and geometric forms. The forms are symbolic of what Kelly refers to as the 'truth narratives' he was taught as a child. Mostly religious and moral in nature, these symbols are altered and abstracted, becoming more puerile and maybe a little vulgar. While Kelly is not interested in a specific moral or religious stance, he is interested in the equal value of truth, ridiculousness, and absurdity--three elements that all find a place in his pieces. In Part + Parcel Epstein and Kelly, first time collaborators, each explore the ideas unique to their own practices while simultaneously beginning a new conversation. 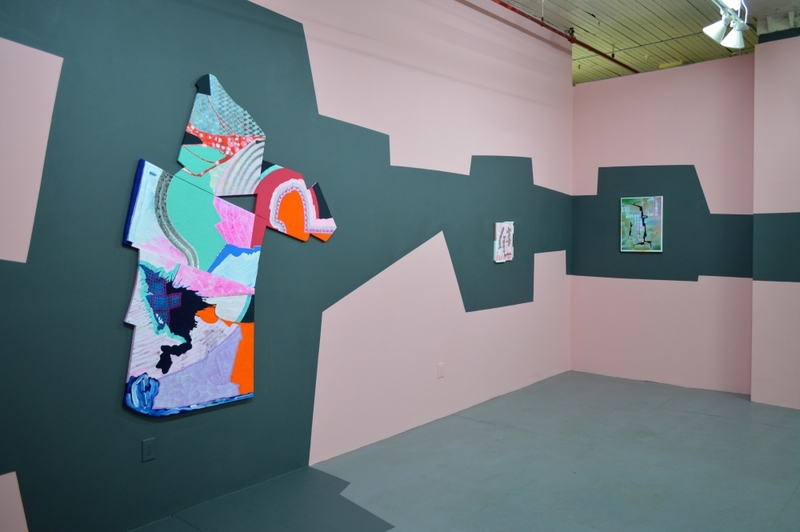 While their works exist separately in the gallery, the surrounding space is painted by both artists-- creating a visual bridge between the two practices. Decisions that get made in private in the intimate space of each artist’s studio have morphed into a public dialog as Epstein and Kelly negotiate painting decisions together for the first time.